Easy mounting with supplied hooks and anchors at the 4 corners, equipped with suspension lugs. Suitable for all common single and double beds. 4 overlapping openings // During the day, the net can be bundled up using the supplied strips and is thus visually an eye-catcher. Material: Textile raw material composition: 100% Polyester // Weight: 0.6 kg // Hand washable at 30 ° C. Do not use brightening agents. Air-dry. 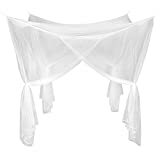 This handy mosquito net protects you against annoying mosquitoes and other insects in your bedroom and thus gives you a restful night. The baldachin can be used for both single beds as well as a double beds. It has a very small mesh size of 156 holes as recommended by the WHO, and ensures optimal air circulation. The net is fastened over the 4 sewn loops onto the supplied hook. During the day, the net with the also included tapes can be bundled up, and thus stands out visually.